The Palace of Culture in Tirana has housed Albania’s national library, opera and ballet companies for almost 50 years. Khrushchev laid the first stone, in May 1959, during what one American newsreel described as a ‘lengthy visit with mysterious overtones’. These days the ground floor of the opera is a count centre during national and local elections. At around 10 p.m. on Sunday, 23 June, three hours after polls closed in parliamentary elections, a queue of officials carrying clear plastic ballot boxes snaked up the steps outside the opera. Policemen in wide-brimmed hats formed a porous cordon around the votes. Party loyalists, with pens and notepads to tally the votes as they were counted, hovered on the terrace, waiting for the lobby to open. Counting had been scheduled to start at eight. One of the tallymen was Erad, a 25-year-old economics graduate. ‘I could be here for two days, maybe three,’ he said, lighting a cigarette. What mattered was that his party, the recently formed nationalist Aleanca Kuq e Zi (Red and Black Alliance), won enough seats to be kingmaker in the new parliament. ‘I think we will do well. If we get three or four seats I’ll be OK,’ he said. Horns blared from the cars on Skanderbeg Square. Young men festooned with flags for the ruling Democratic Party leaned out of windows and shouted: ‘Sali Berisha, Sali Berisha!’ Berisha, a prominent figure in the Albanian Party of Labour under Hoxha and president of the republic in the mid-1990s, was aiming for a third straight term as prime minister. ‘Corruption is our biggest problem. The system is corruption and corruption is the system,’ Erad said. Transparency International ranks Albania 113 of 176 countries in its corruption perceptions index. The opposition Socialist Party disputed the results of the previous general election, in 2009, boycotting parliament for 18 months and claiming Berisha had stolen the vote. In January 2011, four protesters were shot dead in Tirana. Later that year, in the capital’s mayoral elections, the Socialist incumbent, Edi Rama, lost by 81 votes. He had been declared the winner, but it was then decided that ballots that had been placed in the wrong boxes could be included in the final total. Ahead of this year’s election, one Albanian activist told me he expected the result in ‘a week or two, maybe more’. Polling day had begun inauspiciously. In the north, an opposition activist was shot dead and a ruling party candidate seriously injured in a gunfight outside a polling station; a TV crew were attacked, their equipment destroyed. But the rest of the day passed in relative peace, and, despite numerous reports of vote buying, especially in crucial marginal constituencies, the OSCE declared the vote ‘quite fair’. By Monday afternoon it was apparent that Rama was on course for a crushing victory. Albanian politics certainly looks different. On 26 June, Berisha publicly conceded defeat, taking full responsibility for his loss. Rama will be the next prime minister: his coalition won 84 seats out of 140. There was no violence, only more cars, this time decked out in Socialist purple, circling Skanderbeg Square. The Red and Black Alliance, like most of the 60-plus parties that contested the election, won no seats. The European Commission is expected to recommend EU candidate status before the end of the year. Arguably the biggest winners were not the Socialists, who gained only one seat, but their junior coalition partners, the Movement for Socialist Integration (LSI). Until April, when they joined forces with the Socialists, the LSI were in government with the Democrats. The fatal demonstrations in 2011 were sparked by a video of the LSI leader (and former Socialist prime minister), Ilir Meta, appearing to discuss accepting a bribe. His career looked as if it might be over. But he was acquitted of corruption, and now leads a party whose representation has jump from 4 to 16 seats. Albania: Can one of Europe’s poorest countries change its ways? HAJMEL, Albania — Wine production has a long history in the northern region of Zadrima: The first recorded planting of its signature grape Kallmet took place in 1555. Today, rows of well-tended vines filling the neat fields around this small village bask under a hot sun. It feels as if nothing has changed for centuries. Under the old hard-line Communist regime, the authorities ordered these lush vineyards 45 miles from the capital Tirana be ripped up for planting tobacco and wheat. After the Communists were toppled in 1991, huge collective farms were split into hundreds of thousands of tiny individual holdings. But they have struggled under Albania’s ineffective, corruption-addled politics. 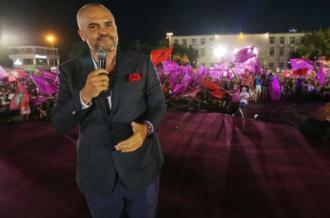 Last week, however, Albania’s Socialist opposition led by the colorful former Mayor of Tirana, Edi Rama, won a landslide victory in parliamentary elections, ousting the government of Prime Minister Berisha, who had dominated politics for two decades. That gave people here high hopes that one of Europe’s poorest countries may finally change its ways and put itself on a path toward coveted European Union membership. Among them is Zef Pashuku. A farmer under dictator Enver Hoxha, he emigrated to Greece before returning in 2000 to take over the family farm. He quickly realized its success would depend on something that still makes Albanians wary these two decades since the communist collapse: going into business with his neighbors. The farms are too small to make it on their own, but “if we join together, we can compete,” he says. That led Pashuku to establish Albania’s first post-communist cooperative farm in 2005, with the help from the British charity Oxfam. Now he hopes Tirana’s new government and the promise of kick-starting a stalled drive toward EU accession will be a boon for his and other fledgling cooperatives. With a membership of around 60 farmers across three villages, the Zadrima collective specializes in wine and oil olive sold locally and internationally. Sharing equipment enables farms to maximize productivity, Pashuku says, liberally topping up his interviewer’s glass of 2011 vintage Kallmet, which retails at around $4 a bottle. Although cooperatives make sense here, where the average income is the equivalent of $330 a month, convincing people of their value has been difficult. “A few years ago, people used to say that sounds like communism,” says Pashuku’s son Jurgen, who is studying agricultural economics at Tirana University and hopes to follow in his father’s footsteps. That’s now changing, he adds. It contributes a quarter of GDP to Albania’s struggling economy, according to official statistics. And with almost 50 percent of the population of 2.8 million living in rural areas, encouraging small-scale farmers to form cooperatives is vital, says Geron Kamberi of Quodev, a social enterprise program in Tirana that’s the successor to Oxfam’s mission in Albania. “Working together as a single unit is really important,” he says. However, changing mindsets will be only part of the task if new ways of cooperation are to flourish. The government, which passed a new law on cooperatives only recently, has been slow to encourage collaboration. Last week’s elections made news when a political activist was shot dead in Lac, near Zadrima, as polls opened. Still, the vote was by far the most peaceful since Albania emerged from Communism. Conceding defeat on Wednesday, Prime Minister Berisha stepped down as leader of the Democratic Party — the first smooth change of power in the divisive, often violent world of Albanian politics. Although the country has been a NATO member since 2009, political strife following the previous elections the same year has suspended EU hopes. Last year, the European Commission said fair and democratic elections this time around were a sine qua non for granting the country candidate status. The EC could now recommend Albania for candidate status as early as December, which would bring significant funds, and, many believe, impetus for reform. There’s much to be done. Endemic corruption has hollowed out institutions. Bribes are common, particularly in higher education. Few believe that the legal system is fair and transparent. And jobs are nearly impossible to find without money and connections. Paradoxically, the ongoing euro zone crisis has helped Albanian farmers. Many of those who emigrated to nearby Greece and Italy are now coming home, bringing new expertise. Cooperatives have recently opened in Saranda in the south, and near the northern city of Shkodra. Tirana, Albania – Under the secretive Communist regime of Enver Hoxha, Blloku was the most restricted district in Albania. Only high-ranking apparatchiks in the ruling Party of Labour were allowed to reside in the tight grid of tree-lined streets located in the centre of the capital, Tirana. In the middle of “the Block” stood Hoxha’s own private residence, an opulent Italianate villa with a swimming pool in the garden, completely at odds with the poverty that most Albanians lived in. More than two decades after the fall of the hardline Communists, Blloku has been transformed into the busiest location in this picturesque Adriatic state. Formerly austere government buildings are now shopping emporia and luxury flats. Hoxha’s old house is still there – but now it’s a popular open-air bar. Currently, Blloku features something else unimaginable in Comrade Enver’s authoritarian time – election paraphernalia. And lots of it. It’s hard to walk more than a few metres in Blloku without coming across a poster for the ruling Democratic Party, a billboard for a the small LSI party, or even a stencil in support of the main opposition, the Socialists, spray-painted on a wall. On Sunday, June 23, Albanians go to the polls in parliamentary elections for the first time since a contentious vote in 2009. The choice is essentially the same as four years ago: incumbent Prime Minister Sali Berisha and his Democratic Party – in power since 2005 – or the Socialist party led by the former mayor of Tirana, Edi Rama. Electoral coalitions are the norm in Albanian politics. Rama is leading the “Alliance for a European Albania”, which includes the Socialists, LSI, a Greek minority party and four small Communist groups. Berisha’s “Alliance for Employment, Welfare and Integration” – led by the Democratic Party – includes the Republican Party and a party for the Chams, a group of Albanians originally from near the Greek border. Most polls put the Socialist alliance ahead – but the result is far from certain. Earlier this month, Berisha cut the ribbon on a new highway linking Tirana and the industrial city of Elbasan to the south. An hour and a half journey on dangerous mountain roads has been cut down to just 40 minutes. But Ziu is not impressed. “They say they have done the roads but they will only last a year or two. They were not built properly,” she said. Not everybody is dissatisfied with Berisha. A little further down the street, shopkeeper Fatos Kume said he will be voting for the craggy-faced northerner and former cardiologist who has dominated Albanian political life for more than two decades. “Everyone can see the difference he has made,” he said. Rama has attacked Berisha for his failure to tackle Albania’s economic problems and the endemic corruption. “We are in a deep economic crisis, with high unemployment, bad services, (and) a very poor social situation, especially in suburbs and rural areas. Corruption and crime are big problems,” the Socialist party leader told Al Jazeera. “The core problem of Albania has to do with the fact that our economic model has exhausted itself. It has been based for many years on wild exploitation of resources, on constructions and on the remittances of emigrants, no job creation and no productivity. It is time to turn the page and build a new economic model,” Rama said. Both the Democrats and the Socialists have committed to creating upwards of a quarter of a million new jobs. Berisha’s party plans to attract more foreign direct investment by establishing a 10 percent flat rate on all personal income and corporate taxes. Rama has promised to lower taxes for low-and middle-income employees at the expense of higher income earners. There has been little thought given to how “Albania is going to face these turbulent economic times”, said Dervishi. As is often the case in Albanian elections – and those elsewhere – the campaign has been dominated more by personalities than policies. Berisha and Rama have a long and acrimonious history. After the 2009 vote, the Socialists boycotted parliament, accusing Berisha and the Democratic Party of stealing the election. Two years later, four people were killed in Tirana when police opened fire on protesters at an opposition demonstration. The beleaguered country also has a chequered election history. Previous votes have been marred by allegations of vote rigging, violence and intimidation. This time around there have numerous reports of vote buying, particularly in the key marginal districts that will decide the outcome of Sunday’s vote. “We have reports coming from poor citizens of being offered money in exchange for their vote, or young voters who are thrown parties and [offered] excursions by candidates to win their favour,” said Aranita Brahaj, project coordinator for ZaLart, a website which collects reports about alleged electoral fraud from across Albania. “I think it is not a democracy, as some citizens cannot have a vote because they are poor,” said Brahaj. There are question marks, too, over whether the result can be verified after Sunday’s vote. Following a split in Berisha’s ruling coalition in April, the Central Elections Committee (CEC) has only four sitting members – one fewer than the five required to declare the result of the election. All the main parties support membership of the European Union. But the accession process has stalled badly in recent years and the EU has warned that it will be watching Sunday’s vote closely. The election must be “in line with international and European standards”, Catherine Ashton, the European Union’s foreign policy chief, said in April. Given Albania’s turbulent electoral history and the machinations around the Central Elections Committee, few are expecting a quick result.